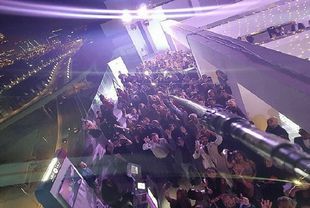 ITP Live, the social influencer division of ITP Media Group, broke an official Guinness World Record on Wednesday night for the “picture taken with the world’s longest selfie stick”. The record was broken at the official ITP Live launch party at the Viceroy Palm Jumeirah Dubai hotel. The title had previously been held by Blasteem’s Matt & Bise, two Italian bloggers who created a selfie stick measuring 15.57m. ITP Live beat the record with a selfie stick measuring a whopping 16m with the record-breaking selfie captured by a Samsung Galaxy S8. The event was held at Penthouse Suite of the new Viceroy Palm Jumeirah Dubai hotel, which was attended by senior media agency teams and selected GCC influencers boasting a social reach in excess of 10 million. ITP Live’s social influencer agency operates across the GCC and has already started working with brands including L’Oreal, Unilever, Galeries Lafayette, DTCM, P&G, ADCB, Porsche, Mazda, Bourjois, Al Tayer, KFC, Souq.com, Godiva and many others. The ITP Live Party was presented by e-commerce store E-Labelz and supported by award-winning agency Garage 366, Emirates NBD, kaya Skin Clinic and skinue and the event partners were SKAI, Shock Talent Management, MMI and Viceroy Palm Jumeirah Dubai.